Mississippi is well known for its rich soil and plantation mansions, but the bluffs and prairies of its eastern boundary are often overlooked. Here, Jim Fraiser takes a deeper look at those historical gems of eastern Mississippi and its coast. From Pascagoula to Tupelo, and Jackson too, the beauty of Mississippi’s historic homes shines through Rick Guy’s stunning photography. With each house pictured, readers learn interesting tidbits about the history of the home, the surrounding area, and the owners (or former owners). 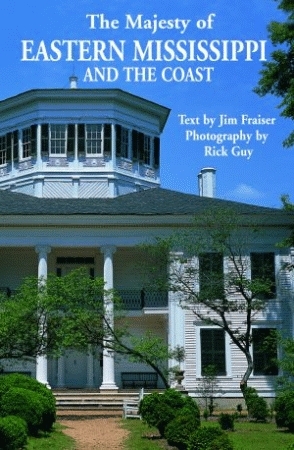 For those who love architecture, The Majesty of Eastern Mississippi and the Coast will be a wonderful addition to their collections. Several styles are covered, from the elegant Greek Revival of Waverly in West Point to the Colonial Revival style of Ballymere in Pass Christian. Spanning nearly one hundred years, from the mid-nineteenth century to the early twentieth century, this book has everything. You can even find Hollywood trivia—discover where Robert Mitchum filmed his 1950s film Home from the Hills. The fantastic images of authentic era refurbishing, interior settings, and antebellum designs portray the influence of the different cultures that collided in the South. From the first page to the last, excellent photography and enthusiastic writing combine to make this a smart selection. Jim Fraiser is a practicing attorney representing the Mississippi band of Choctaw Indians. He is also a college professor and freelance journalist/photographer for various publications throughout the South. He is married with two daughters and lives in Jackson, Mississippi. Rick Guy is an award-winning photojournalist whose credits include Newsweek, Time, and People. He currently works for the Clarion-Ledger in Jackson, Mississippi, where he resides with his wife and two children. Foreword by John J. Fraiser, Jr.